For a game I talk about, 1993 is a pretty recent release year. SimCity Enhanced Edition (Maxis/Interplay, 1993) is an example of what adding sprinkles over a dish does. Unsurprisingly, the effect is negligible. 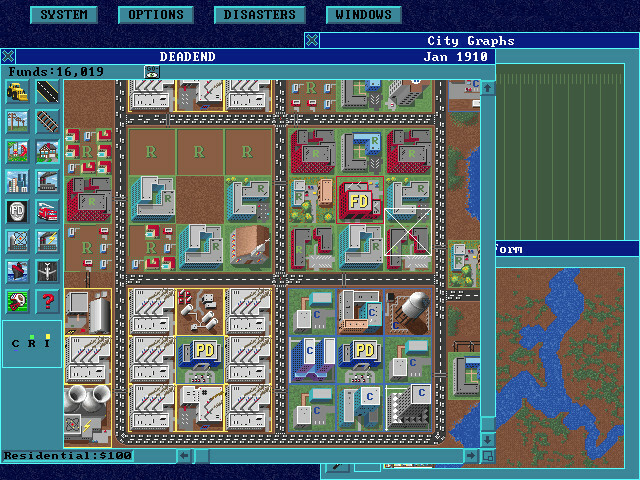 SimCity EE hit the stores close to when SimCity 2000 (Maxis, 1993) did and that game has stood the test of time far better than this slightly changed version of the 1989 original. Nowadays, SimCity isn't the only or the biggest kid in the field of city builders (see Cities: Skylines (Colossal Order/Paradox, 2015) for that). In this genre, the player needs to balance the town budget, zone areas for different purposes (like residential, commercial, industrial) while planning ahead to avoid road congestion, high crime rates, pollution and overall unhappy residents. SimCity isn't a turn-based game, although I imagine many people came close to wishing it were when the initial money stash had run out and waiting for taxes to be collected was so boring... or so I thought; more on this towards the end of the blog. Designing the town in SimCity is simple. The random-generated map is plain 2D, all zones are placed in three-by-three squares and many things were simpler here than in the later installations. The infrastructure is limited to just power and transportation (road and rail). Junkyards, not here. Water supply, not here. Graveyards, not here. Bus stops or routes, not here. Subways, not here. Hydroelectric power, not here. Connections to adjacent towns, not here. Money is cheap -- I mean cheat. If you press down Shift and type in the first letter of the first five paragraphs in this blog, the town bank account gets a good boost of $20K. And it's not a single-use code either... but overusing it may result in an earthquake. Solution? Use the code before you build anything. Place the polluting power plants and industry zones at the map borders: pollution outside the map is not your -- or the SimCity residents' -- problem. The game even tells you this. Actually, this could be called accurate simulation. You can bulldoze corners or sides of a residential zone if another one wouldn't otherwise fit. This will hinder zone development, though. Keep pressing shift and the roads, rails and powerlines you build will be in a straight line. Again, something the game might tell you. The premise is that the player is given some money and they need to start building up a town from scratch until it becomes a megalopolis (and stays that way). Alternatively, the player can try winning so-called scenarios: they start with a lump of money as a disaster strikes a pre-built city. Fixing the crime problems in Detroit 1972. Aftermath of a (fictional) nuclear meltdown in Boston 2010. I haven't looked at how accurate these maps or scenarios are. I'm pretty sure Tokyo wasn't razed by a giant monster in 1957. 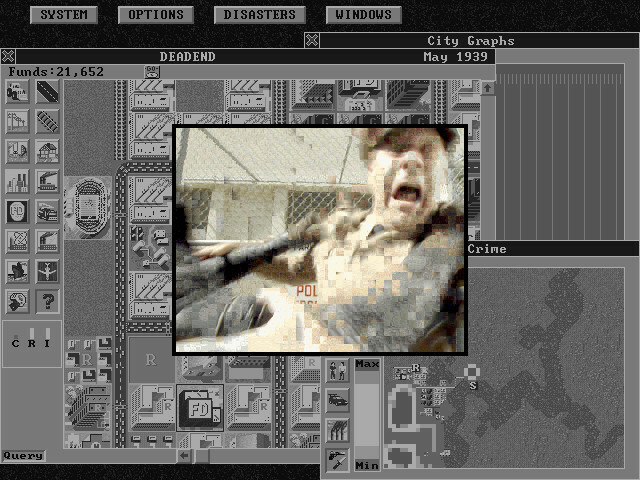 SimCity itself didn't take much disk space; after all, some versions of it were running on 8-bit microcomputers and, of course, the SNES port is well-remembered title. So if the game took only a little space, what to do with the extra space the CD-ROM afforded the Enhanced Edition? Video. Glorious, highly compressed cheesy full-motion video. And audio. Digitized speech used frequently enough to make Bubsy blush. Click the residential zone icon, hear "Residential zone, one hundred dollars." The files outside audio and video directories take less than 2 MB, which would fit on two 3.5" floppies, and easily into one when zipped. The audio and video, though, take 311 MB. In total, there are 23 minutes of voiceovers, not counting the videos. Some clips are long, like "The entire population of this city has finally had enough of your inept planning and incompetent management! An angry mob -- led by your mother -- has been spotted in the vicinity of the city hall. You should seriously consider taking an extended vacation NOW... or read the manual and try again." Many are like the aforementioned residential zone pricing information. 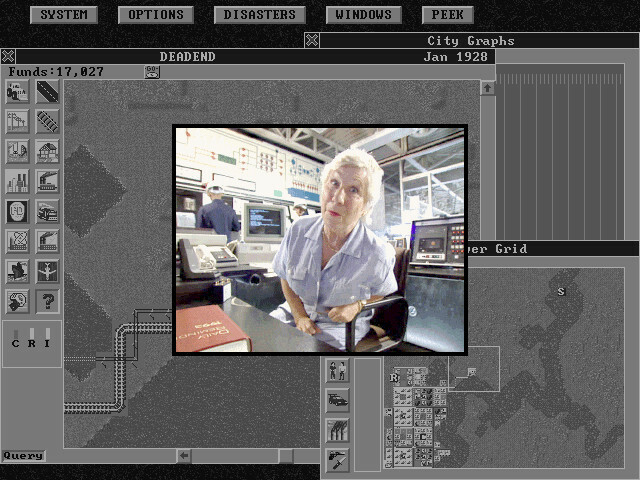 If you remember the Dr Wright character in the SNES version of SimCity, this game uses live actors in lieu of him. There's Milt Kogan playing the role of the police chief John P. Ferguson, Miguel Pérez as fire marshall Edward Oliverez, Lou Beatty Jr the secretary of transportation and so on. Chances are you haven't heard of any of them, as would be expected, and of the main people in front of the camera, they are probably the best-recognized. The police chief Ferguson getting robbed at the parking lot behind the police station. 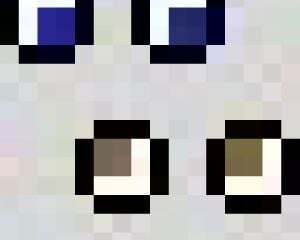 The video can be stretched to full screen, but the compression artefacts remain. This is one of the clips with worse-than-average video quality because of the rapid movement. The writing is actually somewhat funny. Not everything works especially in 2018, such as the clip where news anchor Carol Davenport lets people know Gojira is coming and the voice changes to a presumably fake-Japanese accent. But the alternate monster clip, despite using popular culture references, is still great. But then the producers went even further and recorded small clips that were "peeks" into the lives of the denizens in the town. Remember, this was 1993 and The Sims (Maxis/EA, 2000) was a long time away. These clips don't seem to really have any correlation with how the town is faring, but there are both funny (Newton's cradle, "Java!") and touching (alcohol) clips. 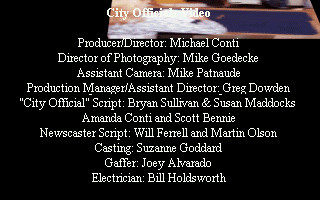 Some of the clips are interesting in that they capture something of the early 1990s. 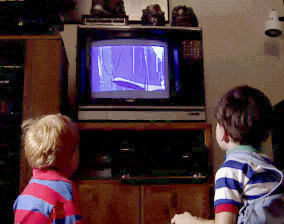 In one clip two children are playing Another World (Delphine Software, 1991), another game Interplay released on SNES in 1992. Given the colour and the shape of the joypad in the child's hand, I'd think this is the SNES version and not a Megadrive one. This time, I had the fullscreen video option checked. Scott Bennie? Not mentioned on the game's IMDB page, but someone by that name worked on other Interplay games of the time, such as Star Trek: Judgment Rites (Interplay, 1993). Will Ferrell? Not mentioned on the game's IMDB page, so that might be misleading info. Martin Olson? His later credits mention Phineas and Herb. So there's plenty of voiceovers and video... but no music at all outside the video clips. That's a definite minus. The CD also contains twelve user-created cities, mostly from some CompuServe contest. The README-file says they're a companion disk to The SimCity Planning Commission Handbook (Johnny L. Wilson, 1990). As for how the game plays on DOSBox: very well. Given how in 1993 releasing a game on a CD-ROM was close to being a copy protection by itself, the biggest issue in running the game from the CD is that the spin-up times are annoying and may briefly freeze up DOSBox. In fact, it's better to just copy the video and audio directories to the hard drive. The game setup program allows for specifying alternate directories where to load these files from, so they can be just as well be copied under the installation directory. This might be a DOSBox-specific issue, but I noticed that at least the "warp speed" option for simulation speed is not independent of the emulation cycles. With under 3000 cycles, it took a over a minute to simulate one game month (I didn't wait any further). With 20000 cycles, simulating a full year took 20 seconds. Less motion means better video quality. The FMV and voiceovers in SimCity Enhanced Edition don't change the underlying game: they can all be turned off if so desired. I can't tell if the EE looks better or worse than the original SimCity on PC, as the little I played of the latter was on a monochrome display. But I have played more than a bit of SimCity 2000, and I don't think there's a good reason to play SimCity on PC over SimCity 2000. While I generally consider simplicity a valid reason to prefer one game over the other, being able to build subways in SC2000 means a lot. As does having more than just two types of powerplants. And that there's background music and laying down roads and rails doesn't hurt the ears.